Transforming Conflict, Building Peace and Sustaining Democracy in a Divisive World. Melchior decided to concentrate his efforts in two areas – very much inter-connected: religious peace transformation and building models for a sustainable democracy. 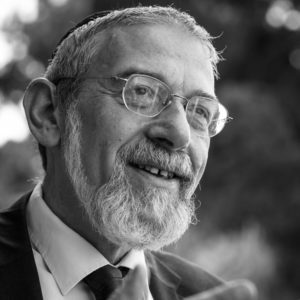 Since 2010, Robert Weil and the Robert Weil Family Foundation are major partners and supporters of Rabbi Michael Melchior's groundbreaking social initiatives throughout the Middle East as well as in Scandinavia and beyond. Rabbi Melchior was born in Denmark 1954. He served as Chief Rabbi of Norway until 1986, when he immigrated to Israel. After the assassination of Prime Minister Itzhak Rabin, Michael Melchior shifted focus towards Israel and the Middle East. He was elected to Knesset where he served for 10 years. His main fields were social justice, education, children's rights and environment. He served as Deputy Minister of Foreign Affairs to Shimon Peres and was the first ever Cabinet Minister for World Jewish Affairs and Israeli Society. With 25 years of experience from government and civil society, Melchior watched the world transform from a place of optimism, human rights, dignity and victory of liberal democracy, into a place of fear, hatred, insecurity, building of walls and the financial fall of the middle class. Melchior decided to concentrate his efforts in two areas: religious peace transformation and building models for a sustainable democracy. Having followed closely all the failed attempts for peace in the Middle East, Melchior saw that something basic was missing. The tent of peace had become too small and exclusive. By defining peace in purely secular terms, the peace processes left outside religious and other identities, something that blocked and even blew up the possibility of any progress. Michael Melchior and the Jewish and Muslim partners, have established six centers for peace in the most difficult places in the Israeli and Palestinian areas. They have identified that even in the more radical Muslim communities there is an exciting new thinking, a process about how to combine a total devotion and fundamental loyalty to Islam and Sharia Law with values of democracy, human rights, secular state and peace. This process is blocked by the Israeli Palestinian conflict, but the religious formula for peace and end of conflict with Israel that Melchior's Muslim partners have reached, could make immense change and be an important development for Islam in the Middle East as well as in the rest of the world. Also on the Jewish side, more and more leaders are joining the coalition for peace, realizing that between the Mediterranean and the Jordan river nearly half the population are Muslims, as well as all Israel's neighbors. As long as Israel could convince itself that there was no partner, that Islam could never live with the State of Israel in the area, they did not need to find an honest way to compromise. But now, radical but sincere Israeli leaders meet with their Islamic counterparts and discover a willingness to find a solution including, and not excluding the other. The model of religious peace, being faithful to one belief, being confident in the limitations and modesty of one's existence towards G-d and fellowman, makes it possible to build new coalitions, give a new hope for peace and a partnership of values in the Middle East and all over the world. The second field of activity is in the realm of the threat to democracy. Many feel that they are governed by others, that they are excluded and are convinced that government does not serve their best interests. Liberal democracy has also been lacking the ability to include collective identities, ethnic, cultural and religious, which play a dominant role in most peoples' lives. 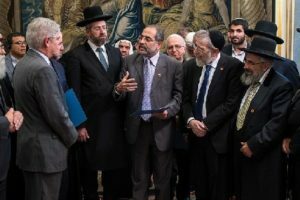 On the basis of these issues, Melchior founded the Citizens' Accord Forum in Israel, which built a model of deliberative dialogue, where people from all identities: ultra-orthodox, secular, Ethiopian and Russian immigrants, from the periphery and urban, Arab Nationalists and Islamists – all sit together around the same table. They sit not in order to discuss how discriminated they are, although they all certainly have such feelings, but to work out how to find solutions through dialoguing together. These debates take place all over the country, with specific groups such as social workers, lawyers, teachers, politicians or religious leaders, or often just as a cross-section of society. Youth parliaments of Jews and Arabs have been created in mixed cities, which have been empowered to participate in the decision making of the youth policies in their municipality. The agenda can be very diverse according to the wishes of the group. Every issue can be on the table, issues such as sexual and physical abuse in the family, solutions for the elderly who are in the beginning stages of dementia or ethnical screening at the borders. These are issues where inclusion of communities and collective identities in order to find solutions are crucial. The debates are held in cooperation with governmental and municipal agencies, that legitimize the democratic process to the thousands of participants. The model is being studied and copied in different ways in Europe, Africa and the U.S. This past year a large ethnically diverse group have been invited to present the model at ECMI (European Center for Minorities Issues) the largest center for minority studies in Europe in Flensburg, Germany, as well as the Kettering Foundation in Dayton, Ohio. The forum also has experts from all over the world who participate in annual international seminars in Jerusalem, including a wonderful teacher from Ghana, Ms. Ruby Quantstone.